The North Central Region of Gold Star Wives includes the states of Minnesota, Wisconsin, Iowa, Nebraska, North Dakota, and South Dakota. The Region has two chapters: Omaha Area Chapter in Nebraska and Minneapolis Chapter in Minnesota. GSW members who don’t live in the proximity of a chapter are referred to as Members at Large (MAL). Region membership is about 240 currently. At least six past national presidents have been from North Central Region. With MALs scattered over five states, contact is limited. Communication is done through Region newsletters, at least two per year, through the quarterly National Newsletter, and the annual Spring Conference held on a weekend in April. The chapters take turns hosting these conferences. For 2018, it was Omaha Area Chapter's turn and the conference was in Bellevue, Nebraska, April 28, 2018. This is where members can come together and meet others, get a sense of belonging, start friendships, and learn more about Gold Star Wives than what the publications tell you. Those who attend are always treated to an enjoyable sociable experience. The Region Conferences are ideal for MALs to meet other members, make new friends and learn what GSW is all about. Most of the Region officers happen to be members of one of the chapters, simply because not enough MALs have come to the conferences and become involved. MALs are strongly urged to take the plunge and come to a conference on their own (or even attend a National Convention). Even coming without knowing a soul, you won’t be a stranger for long. MALs can and do make a difference. Gold Star Wives and North Central Region take pride in serving the community at large and supporting our nation’s veterans. In our region, we have chapter members and MALs volunteering and contributing in various ways to their local veterans’ and military medical facilities, and to a broad spectrum of charitable endeavors. 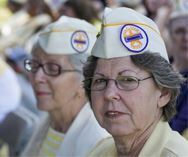 We are aware of members volunteering at veterans’ facilities in Iowa, Minnesota, Nebraska and Wisconsin. There may be others we don’t know about and would like to hear from them. Each year, members have the opportunity to report their giving and service. Reporting forms for individual service are sent with the GSW National Newsletter each December and results are compiled for the whole organization.